Cannabis legalization in Colorado has brought the state nearly $2 billion in cannabis sales, several hundred million dollars in tax revenue, and general scholarship funds for college-bound students. It has also apparently increased property values in the city of Denver—at least in the areas near the city’s retail cannabis shops. Homes near retail cannabis stores in Colorado gained 8.4% more value than homes further away from the stores. That’s the word from the Wisconsin School of Business at the University of Wisconsin-Madison, which earlier today released the results of a studydone by Dr. Moussa Diop, an assistant professor of real estate & urban land economics, along with James Conklin of the University of Georgia and Herman Li of California State University. The researchers found that legal cannabis has not impacted housing or property prices negatively, and in fact increased values near retail stores. According to the study, single family residences within 0.1 miles of retail cannabis establishments saw an 8.4% increase in value, compared to residences located just a little further away—between 0.1 miles and 0.25 miles—from a store. The relationship between cannabis legalization and housing prices is important to note, said Diop, particularly when looking at the effects of legalizing adult-use cannabis. The study flies in the face of often-raised fears about cannabis stores lowering nearby property values. Just last week, the Sacramento Bee ran a story about California homeowners worried about the negative impact of cannabis on home prices. That story focused on the effect of cannabis growing, though, not selling. The study did not seek to identify the reasons that property near cannabis retailers gained value faster than comparative samples. The authors did speculate about some potential explanations, though, including a surge in housing demand caused by cannabis-related employment growth. In Leafly’s latest Cannabis Jobs Count, we found that legalization now supports 26,891 full-time jobs in Colorado, up from 23,407 one year ago. Not all cannabis businesses are equal, though. Realtor.com noted that homes near recreational shops were priced comparable to homes away from those stores, but appreciated in value 4.8% faster than the comps far from retail stores. 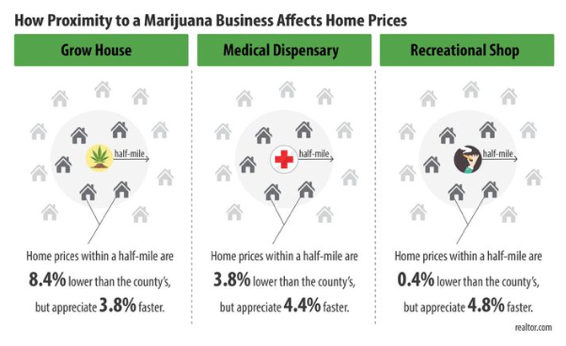 Homes near cannabis grow operations, by contrast, are priced 8.4% lower than comparable homes but appreciate in value 3.8% faster than homes far from grow sites. Diop and the rest of the research team also mentioned the possibility of lower crime rates and additional amenities locating near those cannabis businesses. The researchers used residential property information from the City of Denver’s Open Data Catalog and a list of retail licenses granted by the Colorado Department of Revenue. You can find the full report on the University of Wisconsin website here.